Working with salt water chlorinators is in many ways is a pleasure; you get sustained high levels of santization without having to deal with the unpleasant odor and chemical irritation of dealing with chlorine as a physical product. 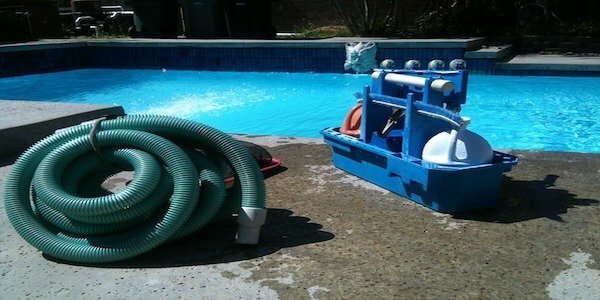 However, this unfortunately does not negate the need for some basic maintenance to the pool. This article discusses salt water pool maintenance and recommends some very basic practices to get you started. Below are a few tips and guidelines that should help ensure that you know what salt water pool maintenance looks like, how to do it and why. The salt cell in particular is prone to residue buildup. This is as a result of attraction of free ions to the charged plates resulting in accumulation of the minerals. If left unchecked, continuous deposition will render the plates useless and as a result the entire unit will not function as expected. It is therefore very important to ensure that the plates are cleaned on a regular basis. More information on cleaning plates can be found in our article called How To Clean Chlorinator Plates. This is a salt water pool maintenance practice where a very high concentration of chlorine is introduced into the pool by increasing the amount of salt added. This is useful for getting rid of accumulated micro-organisms that become tolerant to the pool’s ordinary salt concentrations. Read more on pool shocking in our article How to Shock a Saltwater Pool. This comes in especially handy when the unit has been in use for a long time. This is because continuous use leaves many parts of the unit prone to irreversible damage. This maintenance practice is more often than not run on parts of the cell itself or the system’s wiring circuit. Of all the important maintenance practices, this is one of the most important. It is the most reliable diagnostic tool as it allows you to gauge the entire unit’s performance. As a result, it is done on a more regular basis with some even doing it once a day. Some units even monitor pH levels for you and will inject acid into the water accordingly to maintain correct pH levels. If you’re unsure how to test your water at home, take some sample water along with details of your pool to your closest pool shop or hardware shop and they should be able to test it for you and give you some and advice on how the water is looking. Our last tip on salt water pool maintenance practices is to keep debris out of the water as much as possible as leaves and other organic material contain acids which can alter the pH level of the water and also introduce contaminants to the pool. Clean your skimmer box on a daily basis if possible and vacuum as regularly as you can. It ensures the system’s longevity and durability. It protects pool users by ensuring optimum sanitization. It protects the system’s parts from further damage. It ensures optimum functioning of the entire salt water chlorinator. Having understood what to do and why you need to do it, below are a few tips that should help make maintenance practices a lot more successful. For most salt water chlorinators, it is recommended that maintenance practices should be carried out once every season which is basically once every three or four months. This ensures that the system functions optimally throughout that season until the next maintenance session. However, if a problem is noted before or even after a scheduled maintenance session, action should be taken immediately. This mainly applies when you are dealing with delicate technical units such as the salt water cell itself. The manual will guide you on how to safely remove and restore the unit in order to avoid problems in future. Leaving damaged units within the system could cost you a lot in the long run. It is therefore always a great idea to replace or repair them as soon as the problem is noted. This applies with practices such as salt water pool shocking. It ensures that the chlorine gets to work without interference by sun rays. Running maintenance at night also ensures that the pool schedule is not disrupted for too long. In conclusion, the importance of running regular maintenance on your salt water pool cannot be emphasized enough. It will help make your pool safer and ensure that your system continues to function optimally for a very long time. The information above should help make your work a lot easier. That way whether you are working with a salt water chlorinator for a single domestic pool or an entire system of chlorinators for a spa, you know just how to keep them in tip top shape throughout the year.